First and foremost, happy Christmas Eve. In an amazing feat, we've managed to finish the gift wrapping, grocery shopping, menu planning, etc…, leaving things pretty mellow around here as Millie is taking an epic nap and Audrey is staging an elaborate race vaguely reminiscent of Chariots of Fire only involving all of her little animal figurines. 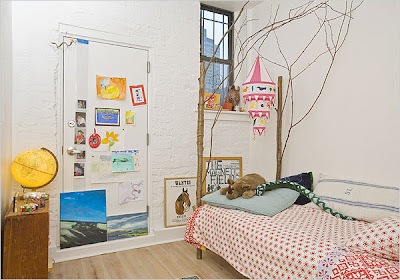 So, I'm taking a quick minute to post this great little-girl room spotted on the NYT. I love how it's minimal and warm and sweet all at once. Actually, the entire house is pretty excellent…check it out if you find you have a spare moment as well. Merry Christmas Joslyn! Enjoy the time with your family! It has been fun spending time with Tim and Julie! OK - knock it off w/ the kids playing cello! I can't take it. But nice minimalistic place. Can't wait for you to play decorator w/ us in the new year, Jos!